STATESBORO, Ga. – The Georgia Southern University Betty Foy Sanders Department of Art presents “24 Pixels: Graphic Design Portfolio Show” April 22 – 28 in the University and Contemporary Galleries at the Center for Art and Theatre. The opening reception is April 22 from 5 – 7 p.m. Light refreshments will be served and the public is invited to attend. “By this point just about everything we encounter in our lives is the product of design: it becomes like water to a fish, something so ubiquitous we often don’t recall that it’s there,” said Gallery Director Jason Hoelscher. “That’s a reason I think graphic design exhibitions like this are so important, because the work is allowed to stand on its own merits, as a crucial part of our culture brought into focus on its own terms and shared for all to see. “Having sat in on some of the graphic design critiques, I can attest to the passion, skills and creativity the BFSDoArt Graphic Design students possess, and am very excited about the fantastic and engaging works on exhibit,” he added. 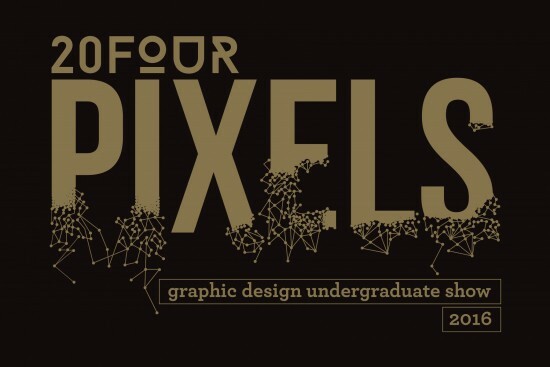 This exhibition features graphic design work from senior B.F.A. Graphic Design majors enrolled in the Graphic Design Portfolio course taught by associate professor Santanu Majumdar. They are Kaitlin Baylie, Sanice Bell, Jackson Brantley, Sara Campbell, Jaimee Collins, Di’monds Davidson, Rebecca Davis, Maya Gleason, Ashley Hillman, Shelby Landes, Brendan Lloyd, Albert Marquez, Shelby Myers, Gianna Palazzolo, Yendi Reid, Kelly Shofner, Alexander Smith, Hailey Smith, Audrey Stamps, Margarita Suarez, Andrew Taylor, Sarah Tholen and TJ Williams.